Even though winter is not nearly through with us...No tears, no tantrums. I pinky swear! Besides! Look what was blooming on Tuesday! Hamamelis vernalis, Ozark Witch Hazel. who used the twigs for divining water wells. its sweet scent drifts about. Spring can't be far behind! I love Witch Hazel! Mine isn't yet blooming, in fact it's buried under a mountain of snow. But those blooms are just so cheerful when they show their faces in what feels like the dead of winter. It always seems like a miracle when they bloom. I love that. Lovely! Finding any color in Winter is always a treasure. I'm even excited about the red bench! I hear the groundhog did not see his shadow which means...an early spring! Hard to believe as the snow and ice continue. Love that witch hazel. I have the native H. virginiana which blooms in the fall. Not orange though. That one is so bright and cheery. Hooray! No complaining here either, dear Gail. Your witch hazel is superb, the color marvelous, the timing of bloom priceless!!!! Awesome - a bloom! They are coming...I think. 21 degrees on the Thermometer when I took G up to the bus stop - cold morning! I have not whined, too much, but this winter has been a challenging one. I hope to see my witch hazel bloom soon, too. Here, I'm having a wee tantrum. Twelve and a half inches of snow and a high of 10F today. I am not a happy camper. I can barely get to the woodpile. How lovely to see your stunning portrait of Hamamelis Gail! The light is warm within your first bloom. If you could see out my windows and doors you would laugh at your dusting of snow. Oh Gail, we are so snowed in and I cannot see the three feet or so of accumulated snow melting away for months now. I will not create a tear either though. I can use the inside time to catch up on so many needed tasks. Your garden looks magical wearing the white covering of snow. Spring is not far away for you! I look forward to seeing more of your garden as it awakens. I am hoping to buy a Hamamelis later this week if I can track down the one I have decided on - not easy because I want to see before I buy. They are beautiful flowers and I like their unusual shape. Hope your snow disappears soon. Hamamelis vernalis make up an important part of my winter wildlife habitat. It's not uncommon to find a bee hanging around on a warm day looking for a bit of food. Lovely sentiment Gail. how wonderful to see hamamelis blooming already, Gail. Makes me think that we'll actually make it through this winter and into the wonder that is spring. Stay warm! I am not complaining either. I am just glad the ice went north of us. Your Witch Hazel looks so exciting. I wish something was happening here but not even the buld foliage is peeking yet. The Ozark Witch Hazel is a nice start for the coming year. Witch hazels are so wonderful! I don't think anything is happening with my witch hazel, not that I could get near it to check. What a breath of fresh air that lovely orange witch hazel is. Perhaps spring really is just around the corner. Awesome on the first bloom!! My witch hazels are sleeping but the edgeworthia is beginning to bloom. Hooray for blooms in January! I wish I could smell your witch hazel thru the computer as it looks luscious! I'm planning a witch hazel for my new border. Your witchhazel is stunning, love it. I am still having the weirdest problems with your blog. It's micro, but...I managed to find the comment button. Must be something off with my Browser. Your witch hazel is beautiful and I commend you greatly for not whining...I'm putting it out there...I'm whining! I'm a wimp! I'm waiting to see if the witch hazel 'Diane' that I planted last spring survived the dry weather. I tried to keep it watered, but I am dubious. I'm not pinky swearing to no tears & tantrums here at Wit's End. I can't ... myy hands are frozen! Looks gorgeous. Love the hazel. Sure wish I could grow it here. Hi Gail, Can't argue with nature. Spring is on the way and oh how nice it's going to be. Stay warm. I had forgotten that your H. veranlis has such bright orange flowers. They are beautiful. What a lovely bloom! Enjoy the start of blooms in 2011! I can appreciate your joy in seeing this first blossom! Here in AZ although it is dry and I'm surrounded by desert terrain I saw my first tree in blossom...I did not have my camera but it sure is exciting to see Spring! Spring in the desert is beginning..but guess what..today and tomorrow we experience record dropping cold temps..EEK!! Gail, your bench looks lovely dusted with snow, and the witch hazel is a sign of promise that spring will be here soon. I'm not whining either--I managed to get out of the Midwest just ahead of the storm and am enjoying sunny skies and temps in the 50's while vising Oregon Daughter. Hi Gail, I'm glad to be visiting old friends again. Love your photo. My garden is lost, buried under a five foot snow drift. Just loved the previous post. You have such a wonderful garden, it's always a pleasure to see what combinations are blooming at different times. Can't wait to see how my PPP overwintered. Hopefully, this year it will be large enough to split up and move around. Lovely posts and photos. Totally inspire by Witch Hazel. At first, I thought its a big huge spider. my mistake but its an awesome photo. Thanks for sharing. 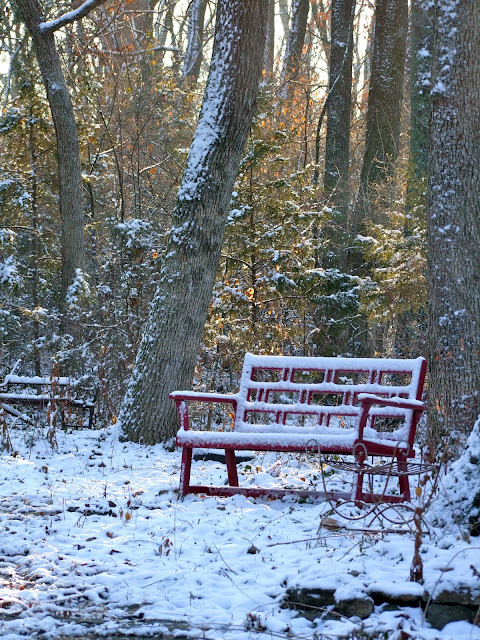 I love that wooded scene with a snow-covered bench. The Garden of Benign Neglect. Great name...and to think...I have one down here as well. LOL Small world. The withc hazel closeup is gorgeous. You should frame it and put it on a wall in your home. Im really iimpressed by it. Hey there, You have done a great job. I will certainly digg it and in my opinion recommend to mmy friends. Howdy! I know this is kinsa off topic but I'd figured I'd ask. My website discusses a lot of the same subjects as yyours aand I think we could greatly benefit fropm each other.